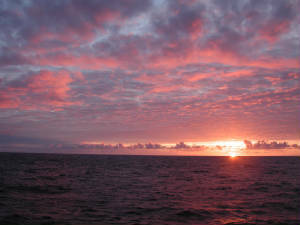 The Drake, named after Sir Francis Drake who was blown off course and into these waters in 1578, is unique among ocean passages. At this latitude the Circumpolar Current, a broad eastward flow generated by fierce westerly winds, runs unchecked all around the globe. The only constraint to its path is the narrowness of the passage (a mere 620 miles) between Tierra del Fuego (Cape Horn) and the South Shetland Islands off the tip of the Antarctic Peninsula. Here the waters constrict to become the strongest, deepest current marked by the most consistently rough weather of all the world’s oceans. Nevertheless, it was just an ocean crossing and I was resolved not to be seasick. With a little help from a Dramamine tablet purchased from the ship’s store, Benny and I went to bed, lulled by the sensation of a cradle rocking. In the morning I was up, but Benny didn’t get out of bed, and judging by the sparse turn out at breakfast, he was not alone. I took advantage of the quickest breakfast buffet line I was to encounter on the voyage and repaired to the upstairs lounge for the morning digital photography workshop offered by master nature photographers Kennan and Karen Ward. G.A.P. had made the extraordinary offer of free rentals of a Fuji digital camera, free rechargeable batteries, and free battery recharges to all passengers, so the morning workshop was mostly an instruction in the mechanics of Fuji camera operation with a few tips on composition. The most valuable piece of advice was Karen’s urging to go out and take pictures now – lots of pictures. I ventured onto the stern deck to take snap digitals of whatever appeared, and there I discovered Ken Wright, the “bird man.” Our ship was followed by a wake of birds, and ornithologist Ken helped us sort out the dolphin gulls, the pretty black and white cape petrels, the black-browed albatross, and the sooty albatross that buzzed us unexpectedly along the starboard deck. Then a sharp-eyed passenger noticed something different across the water. Could that unexpected puff of spray be a whale surfacing? It was. Ken confirmed it and the fortunate few passengers who were still up and alive crowded to the rail to see the dark gray back of a finback whale resurface and “blow.” What excitement! And as a side benefit we had experienced the best preventative for seasickness - to watch the sea, savor the fresh air, and enjoy the adventure. That evening the seas seem to have calmed. Blue sky appeared near horizon and the sun coasted beneath and between the clouds in a splendid display of gold and crimson that continued for hours. Morning of the third day saw a more passengers up and about. Fired by curiosity after yesterday’s incident, we trooped to the upstairs lounge to hear a presentation by biologist Colin Baird on cetaceans. Colin was still setting up his slides when someone opened the lounge door and shouted “Whales!” Grabbing my parka and camera, I hurried to the deck. Peering into a wind so fierce and cold that it brought tears to my eyes, I saw a plume of spray, then a low, dark island emerging from the sea. It was the back of a humpback whale that surfaced and blew several times before diving with a final wave of his tail. This was to be the day of the whales. 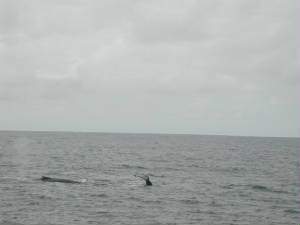 There were several whales in the morning group – both finbacks and humpbacks. In the afternoon the call came again and we climbed to the top viewing deck to see two leviathans off the port bow, so huge that a crewmember thought they must be blue whales. Colin, the cetacean specialist, was disappointed because he didn’t arrive on deck in time to do the identification. Blue whales are the largest and rarest of all whale species, and Colin told us that he had never seen one in a lifetime of marine animal viewing. Apparently today had been no exception. The log recorded the whales as humpbacks. That evening we had our first expedition briefing in preparation for our landing in Antarctica. Most passengers had recovered enough to enjoy the Captain’s Welcome Dinner and a late movie. We went to bed to dream of whales knowing that tomorrow we would make our first actual landing in Antarctica.